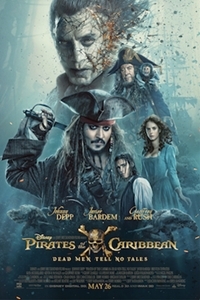 Pirates of the Caribbean: Dead Men Tell No Tales: Depp has nightmares in which he’s forced to watch all five Pirate movies in a row. The challenge of Pirates of the Caribbean: Dead Men Tell No Tales? To make poor old Johnny Depp appealing again. Annnnd...nope. The difficulty of Baywatch: to make a successful R-rated comedy out of a winking, silly TV soap opera. Nooope. The challenging difficulty facing the heroine of The Wedding Plan: to pull off a wedding with no groom in sight. Not gonna say whether or not she succeeds, but the film certainly does. The difficult challenge facing the heroine of A Dark Song: to summon and command her guardian angel through ancient and painful mystical rites. Not going to say whether or not she succeeds, but the film is an impressive, ambitious debut for writer-director Liam Gavin. The challenge of Slack Bay is aimed at the audience, which may have intestinal difficulty while watching. Something about cannibals. And speaking of difficulties, Scott and I were unable to get to the documentaries Elián and Buena Vista Social Club: Adios. Finally, the Grateful Dead doc Long Strange Trip had its one-night stand in the theaters last night. But it’s worth checking out Scott’s review in case it ever comes around again. You know, like a Dead tour. Nov. 22, 2018 @ 11:51 p.m.
Watch all latest movies, TV shows for free on Android devices using MediaBox HD app. Download it from https://mediaboxhdapp.com/ and enjoy all movies and shows for free. April 19, 2019 @ 5:34 a.m.